History: This display illustrates a Post Office service that was introduced in 1891 in answer to the growing number of private messenger companies, who were making infringements of the Post Office Monopoly. Many overseas countries had a long established express delivery service; Prussia for example had such a service from 1842. The Post Office had discussed an express service for at least twenty years. Then in February 1891 the Railway Letter service was introduced allowing letters to be conveyed by rail on payment of 2d to the railway companies. This arrangement was closely followed by the Post Office introducing the Express Delivery service on 25 March 1891. The service commenced as a London only service and was only extended to provincial offices on 1 August 1891. The fee for such letters was 2d plus postage for delivery within one mile or part mile and 3d for every succeeding mile or part of a mile. 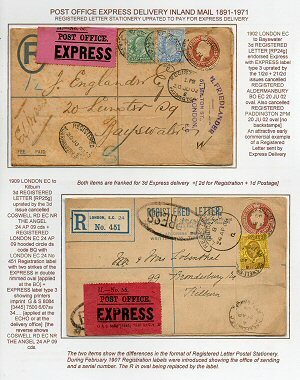 On the 1 January 1892 a new set of fees were introduced with a 3d express fee for every mile or part mile plus postage, or if the letter was delivered locally only the express fee was charged as it was seen that the letter did not enter the uniform postal service. The majority of locally delivered express letters were paid for by affixing postage stamps to a PO form referred to as the E form, again this is seen as not using postage stamps on the letter itself as for the reason given above. The normally franked letters found during this period, and for that matter throughout the eighty years covered, show a franking for postage to the office of delivery then for express delivery within one mile or part mile. Exceptional use is where the delivery extended beyond the one mile and where local letters are found franked by postage stamps rather than unfranked with postage stamps being affixed to the PO E form. One exceptional development was the London Sunday Express Delivery service introduced in 1899, where letters could be posted from the provincial offices for delivery across London on Sunday. This is known to exist until the 1930s [with the service not operating between 1919 --1921] but recommenced after this date in many large centres. Surviving examples are very few in number. The normal express fee was increased to 6d in 1919 and remained so until 1956 when it was increased to 1s, thereafter the fee was increased to 3s on the 17 May 1965 and remained at this rate until 1971 with decimalisation. Postage rates however increased from 1d to 1½d in 1918 then to 2d in 1920 then reduced back to 1½d in 1922 remaining at that rate until 1940, then increased to 2½d remaining as such until 1957 when there was an increase to 3d, then to 4d in 1965 and finally to 5d in 1968. The Express service remained in use after decimalisation but in practical terms became Post Office Special Delivery. and for a more expensive service Expresspost. A Royal Mail Service from 1976. Special Delivery was rebranded in 1980 and became the new registered service in 1998. The Display shows a wide selection of items, from 1891 until 1970, but it must be realised that early items are very difficult to find, in fact any cover dated pre-1920 in fine condition is worth attention. Items from the period 1920-50 should be found in greater numbers and thereafter more difficult again, as less mail was sent express and the service became useful for acquiring philatelic covers, often incorrectly franked. The covers shown are in the main private and commercial from a wide range of individuals and companies. The study looks at the handstamps, of which there were only three basic types, and the labels which really only became varied from the period 1910-34, thereafter only two types were in general use. The labels need some classification in regards to the years in which they were in use and several remain very difficult to find, as they must have had a very short print run. The most obvious attraction must be the various colourful frankings found on express mail, and mainly with cds rather than heavy cancellations. Postal rates and express fees make an attractive display, especially around the period 1918-22 when several changes took place. The display should include Post Office forms such as the E form that is very often referred to, but these did not fall into the hands of the public, therefore are more than difficult to find. The display shows just one Railway Letter sent by Express upon arrival at the railway station, but such a collection could include Railex Letters with the service introduced in 1934 and still in service into the present reign. Perhaps a specialised collection in its own right, indeed there is plenty to supplement this Express Collection as it only looks at mail posted within the UK to Inland addresses.